I have some exciting news! 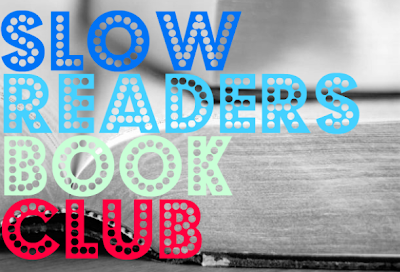 A few lovely bloggers have decided to start a book club and I'm thrilled to be a part of it. 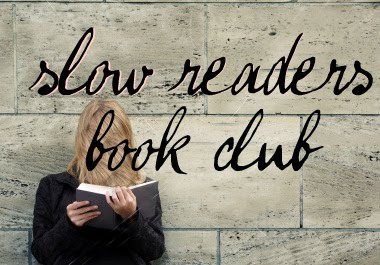 The book club is entitled, "Slow Readers" based off of the Slow Movement, "a cultural shift toward slowing down life's pace." If you're anything like me, you love to read but reading has fallen by the wayside as something that only happens during holidays or when those sleepless nights hit. This year, I'm vowing to allow reading, critical thinking, processing of words, and enjoying books a bigger part of my life. Let me make one thing clear though, this book club isn't about pretentious people reading high brow material, it's about having fun doing something we all enjoy. Books are meant to be shared, discussed, pondered and chewed on and what better way than with bloggie friends? I would LOVE it if you, dear reader, would like to participate. The invitation is open to everyone whether you have a blog or not. If you're interested in joining, please email me with your email address and blog site or leave a comment here with your email address. If you decide that you'd like to join, may I suggest buying your books from Better World Books? This amazing charitable organization sells both new and used books in a sustainable manner. All books are shipped FREE in the U.S. and proceeds go to fund literacy throughout the world. You can buy your copy of 'Half Broke Horses' here. We'll have a two month deadline to purchase and read the book. I'll be posting my review, along with whomever wants to join in on March 4th. If this is something you're interested in, please email me at downandoutchic@gmail.com so that you'll be privy on the newest book announcements and so I can send you some fun buttons if you so choose to post about it. I'd love to get to know you better through discussing these books! Cheers to New Year! I've been MIA for a while...just heard the news! Congrats on the engagement!! That so exciting! I would LOVE to be a part of this! emmie2008 at gmail dot com. i'm the slowest reader ever. What a beautiful idea! i would love to join such an amazing community. Thanks for sharing and inviting us all to join! I am definitely in! I'm midway through a couple of books already, so I'm not sure if I'll be able to squeeze this one in. But I'll definitely be on board with the next book in your lineup! I'm so excited! This is great! I never know what to read so it'll be nice having people tell me what to read! ha! No, seriously though, I LOVE the link you shared on Better World Books! All the guilt that I get from buying stuff disappears when I know there's a good cause in the mix! How cool is this?!! I was thinking yesterday that I really want to be in a book club again. I am so down! Such a great thing to do!! Super excited - great post! Thank you for that link too for the book - I'm going to explore that! i would love to participate! can't wait. Am finally reading The Guernsey Literary and Potato Peel Pie Society....and it took, yes, a holiday to get me there! I am very keen on joining in. Do I just say so here? yes, katiecrackernuts, i'll add you to the list! thanks for your interest everyone! I would love to be included in this! I love book clubs. I read so fast and I am always looking for something new to read! Great Idea! Please add me to the list. I phoned around my local book stores yesterday and now have the book in my hot little hands. Now, for some reading time. Please add me to the slow readers list.. how exciting and such a relief.. I have been meaning to join in all week--it was a crazy busy one--and so finally, sigh, I'm here and would love to be part of it. March 4 is my b-day, so it's perfect! Please count me in! I'd love to join the bookclub! I have no idea why its taking me this long to get on this wagon. Reading is my favorite thing, something I do EVERY day without fail. Right now, I'm already in the middle of another book, so I will either shift into high gear and finish it and try to read Half Broke Horses by March 4th or if I don't, I will def be doing the next book! Looks like I am a little bit late to find this, but thankfully I've still made it in time for this (two) months' book! 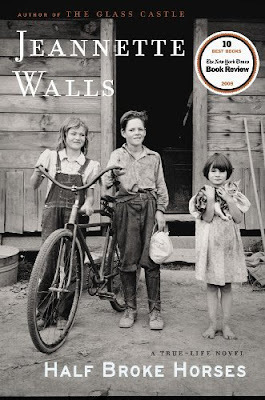 I loved Wall's Glass Castle, very much looking forward to this one!